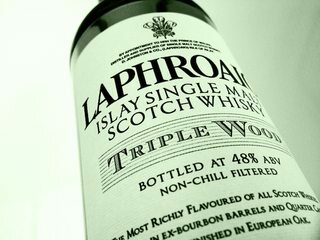 Laphroaig Triple Wood has enjoyed a triple maturation in 3 types of cask. The first maturation in American oak, ex-bourbon barrels, and then transferred into small 19th century style Quarter Casks for a second maturation. The final maturation is in specially selected, large European oak, Oloroso sherry casks. The result is a wonderfully rich and powerful Islay single malt. The Glenfiddich 18 Year Old Ancient Reserve is a truly superb single malt aged in Oloroso (Sherry) and Bourbon casks. This has created an amazingly smooth, mellow, and full flavoured whisky. Sullivans Cove Single Cask American Oak Whisky is double distilled using Tasmanian barley and only the purest wilderness water from Tasmania's mountains and forests. Matured in hand selected American Oak Bourbon casks and allowed to settle and clear naturally, this single malt retains full, creamy lingering flavours. Each cask is bottled separately, yielding only around 250 bottles, making this our rarest Sullivans Cove Single Malt Whisky. 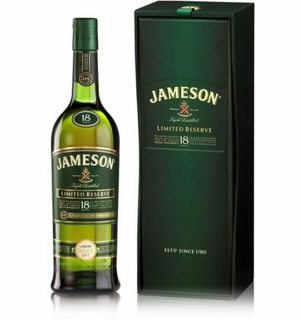 First introduced in 2002, Jameson 18 Year Old is the Master Blender, Billy Leighton's hand picked selection of very old Jameson Irish Whiskey, aged in oak casks for at least 18 years. Rich, complex and truly rare, only limited stocks of this exceptional whiskey are available, thus each bottle is individually numbered. Bruichladdich's Islay Barley is the ultimate expression of provenance: single malt, single barley variety, single harvest and even a single field! Islay Barley is unpeated for maximum barley flavour, non-chill filtered and colouring free. The Whisky is matured in American oak casks that are located in Bruichladdich's coldest warehouse. This is a fascinating exploration of the "terroir" of single malt Whisky. This peaty Single Malt dates back to 1816, when John Johnston and Archibald Campbell each constructed a distillery on what today is the Lagavulin site. After Johnston died, Campbell consolidated the two, before selling it to malt merchant Alexander Graham. Today it continues to uphold the traditions of its past, using meticulous preparation to create powerful whisky. Their signature 16 year old malt has a strong peat, smoke and seaweed nose that is followed by a nutty complexity and light fruitiness. In the mouth characters of Charcoal, dry woodiness and iodine followed by chilli chocolate and a hint of toffee. Ardbeg 10 Year Old Single Malt is typical Islay (eye-la). Light gold colour with exceptional balance and depth on the nose. The aroma is a beguiling mix of toffee and chocolate sweetness, cinnamon spice, Fresh citrus and floral notes of white wine are evident, as are melon, pear drops and a gentle creaminess. There is also fresh phenolics of seaspray and smoked fish. Hickory and coffee emerge on the finish. Since inception in 1881, Bunnahabhain has been producing an Islay malt a little different from most. By not heavily peating their malted barley, the resulting whisky is a clean, pure and distinctive malt. Embodying the 'gentle taste of Islay', Bunnahabhain 12 Year Old is an approachable, welcoming whisky. Ex-sherry cask influence and being non-chill filtered add to the layers of complexity exuding from this premium whisky. Glenmorangie 18 Year Old Scotch Whisky slips like silk over the tongue with a full, rounded flavour, starting with grapefruit & orange. The palate is then entranced with an accord of melting honey, creamy malt and aromatic florals that segue into the warm, syrupy nuttiness of hazelnuts and walnuts from the Oloroso sherry casks in which the whisky is matured. Savour the rich, sticky date and fig flavours as they are heightened by the unexpected caress of woodsmoke. Leading Japanese Whisky with aromas of dried fruit and honey. It has a delicate, mellow taste with a lingering woody dry finish. 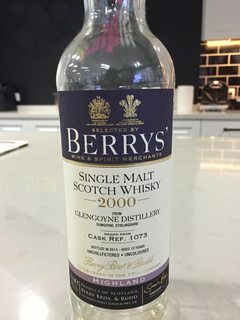 For Scotch drinkers looking for something different. Glengoyne boasts to be the only distillery that uses no peated barley. Located near the southern fringes of the Trossachs, the distillery sits prettily at the foot of Dumgoyne Hill from which a 50 foot waterfall cascades into the grounds. Matured in a first fill sherry cask, this fine dram exudes rich fig and burnt orange peel notes. The fruity sweet palate is balanced by some oak tannins and there is a syrupy intensity which lingers long into the finish. Double matured in port casks, this malt is a toast to the Scottish traders who braved the high seas and were instrumental in founding the port wine trade, shipping it to the world. 'Port Ruighe' (pronounced 'Portree') is the Gaelic spelling of the once bustling trading port on Skye. The Port finish combines Talisker's powerful maritime character with succulent sweet notes of rich berry fruits for a superb contrasting taste experience. The Hakushu Distillery is know as the 'Mountain Forest Distillery' as it stands amidst fresh streams and lush forests. Built with the notion, 'Coexisting with nature', a bird sanctuary was set up to help preserve the natural environment, thus preserving the pristine water that goes into creating the whisky. The 12 year old single malt whisky has a crisp and vibrant taste and can be enjoyed on neat, on the rocks or with ice and soda water.